In many of the countries I travel in, the water is not safe to drink unless it is boiled first. So people always have water on the boil, day and night, at home, at work, in the shops, and even on the road, like here, al fresco. 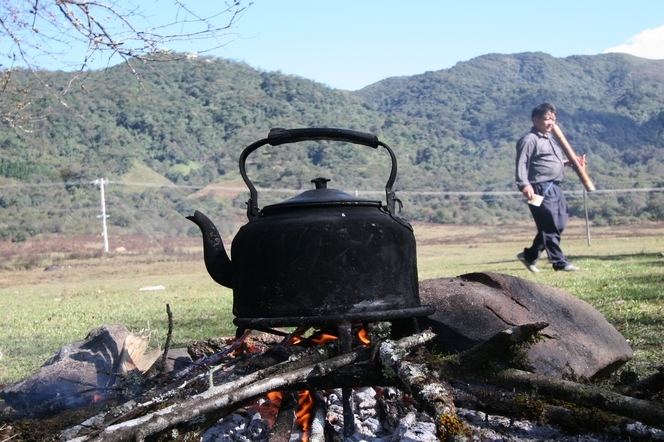 Just after arriving in Sudianlisuzuxiang in Yunnan, while some of our party went off to pluck the birds and others cut fine sticks of bamboo on which to grill the meat, I lit the fire to make tea. On this high and peaceful plateau, once we had eaten our fill and drunk our Pu Er, we stretched out on the grass for a nap. Except for one, who took a stroll with his water pipe.